The life of a quarry manager is not an easy one, the pressure to increase returns is constant. Fortunately, the 21st century has given us the technology to help quarry managers ensure their quarries are performing at their very best at all times. A network connected quarry is the quarry of the future. Here is why. If you can’t measure something, you can’t improve it. The good news is, with a network connected mine, it is possible to measure every aspect of the production process. Detailed reports on activity allow better asset management and help reduce costs. Of course, the best part about the reports quarries will have access to is the speed at which they receive access. In a network connected mine, data is ready in seconds. Therefore, managers are able to make more informed decisions at all times and ensure consistent improvement by measuring outcomes at a level that has never before been possible. In a network connected mine, data is ready in seconds. Instant data capture. Without the need for human monitoring, data is captured automatically and with precision. Automatic data capture gives a clarity across a quarry’s operations that was previously unattainable. Furthermore, managers can pass on the data to executives to ensure more informed decision making. On a broader scale, companies with multiple quarries will be able to give executives a clear, 360 degree view of every metric they could possible need to make the best possible decisions. Quarries often run on a much smaller scale than what we have discussed thus far. Naturally, this brings additional challenges and pressure for managers. This is because cutting costs is absolutely essential. 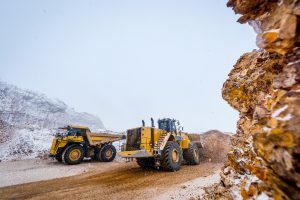 The insights that a network connected quarry could provide have a massive impact in a small-scale setting. These are only a few of the benefits provided by a network connected quarry. To learn more, click here and check out our fleet management software designed for quarries.